At Advanced Environmental Services in St. Louis, we offer epoxy floor coating application services for commercial clients. Our durable, high performance epoxy floor paint is ideal for a variety of commercial flooring applications including in hospitals, showrooms, garages, pet care facilities, kitchens, office buildings, retail stores, and more. Our epoxy commercial floors create an easy to clean, hard wearing surface that will last for years to come. Because our epoxy coatings are available in a variety of colors and styles, they are the perfect affordable commercial flooring solution. Our epoxy floor coatings are ideal for a variety of types of commercial flooring applications from retail spaces and showrooms to medical offices and restrooms. 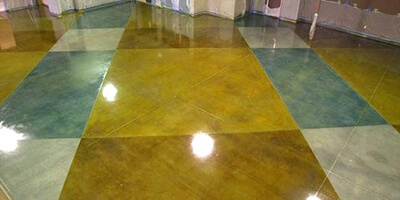 Our epoxy flooring can transform old, worn concrete floors into aesthetically appealing and functional floors. Because our epoxy commercial flooring is low maintenance and easy to clean, it is an ideal choice for a variety of commercial applications. Our epoxy floors are easy to clean, durable, and attractive, making them the perfect choice for a variety of commercial flooring applications including in hospitals, showrooms, and retail spaces. If you have been searching for a commercial flooring solution that is quick and easy to install and offers a durable, low maintenance surface, epoxy floor coatings from Advanced Environmental Services are the right choice for you. Please feel free to contact us to learn more about our epoxy floor installation services or to learn more about benefits of choosing epoxy floor coatings for commercial flooring applications. Aesthetical Appeal: Our epoxy commercial flooring is available in a variety of attractive high gloss colors. When choosing your flooring, you can select several of these colors, which will allow you to incorporate a unique design or logo into your flooring. Low Maintenance & Easy Cleaning: Our epoxy flooring is ideal for a number of commercial flooring applications, such as in medical offices, hospitals, pet care facilities, and garages, because it is quick and easy to clean. These floors are smooth and seamless, meaning that they can easily be wiped clean to remove dust, dirt, or debris, resulting in a hygienic, dirt and germ free surface. Additionally, this commercial flooring requires little maintenance including no frequent waxing or stripping and refinishing. Durability: Our epoxy coatings result in a hard wearing, durable surface that is perfect for nearly any application. Our epoxy commercial flooring will not chip, scratch, or fade, and will last for years to come even when used in garages or showrooms. Easy Installation: Our epoxy coatings are quick and easy to install as they can be installed over new or old concrete floors. Regardless of the current condition of your flooring, this commercial flooring option offers simple installation by our professional epoxy floor installers.